In this digital age, where everyone is a slave of virtual reality, it becomes imperative to break the shackles of technology and explore the outside world, a world full of possibilities and opportunities. Therefore, to motivate students and give them a glimpse and taste of the real competitive world, it becomes our duty to provide them with such an exposure which not only brings them face to face with the reality, but also gives them a platform to showcase their talents, abilities and skills in front of the entire world. 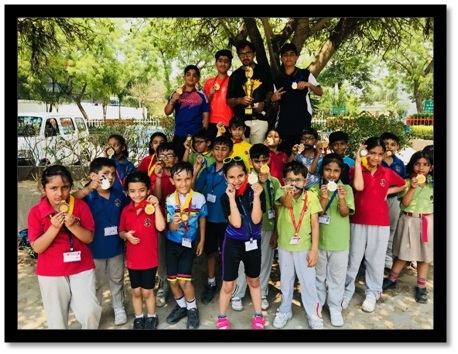 One such opportunity was provided to our students, wherein 33 eximious skaters participated in an ‘Inter School Skating Championship’ held at Chilla Sports Complex on May 10, 2018. Our skaters did the school proud by bagging 21 medals—8 gold, 5 silver and 8 bronze medals. Overall our proud winners of the World of Wheels stood II.